The girls room is finally set. Most everything is from Target. The bunk beds. The shabby chic fairytale bedding and coordinating throw rug, pillow and wall butterflies. This little chair was maroon crackle finish that was peeling. I finally painted it this nice baby blue. This mirror was in K's old room and I talked about how I made it here. Then I hung up hooks to put their dress up stuff on. 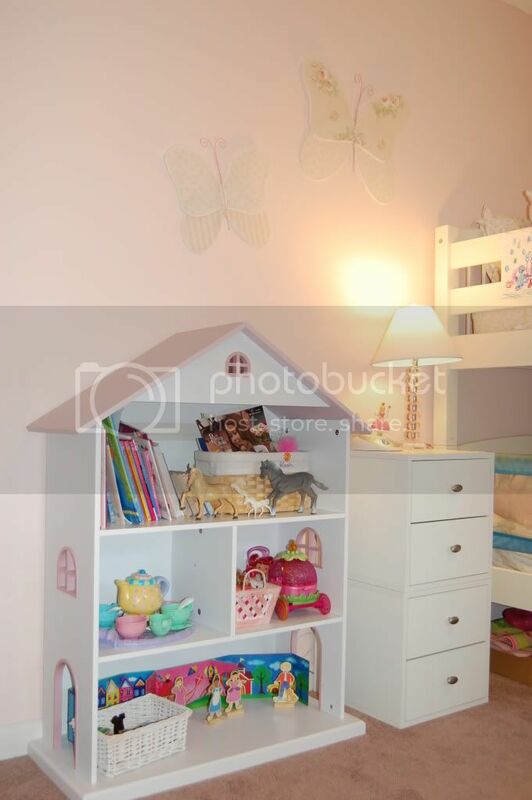 This cute dollhouse shaped bookshelf is from Target as well (and the lamp). One day I plan to let her use it as an actual dollhouse, when I find/make some cute furniture and some dolls to go in it. 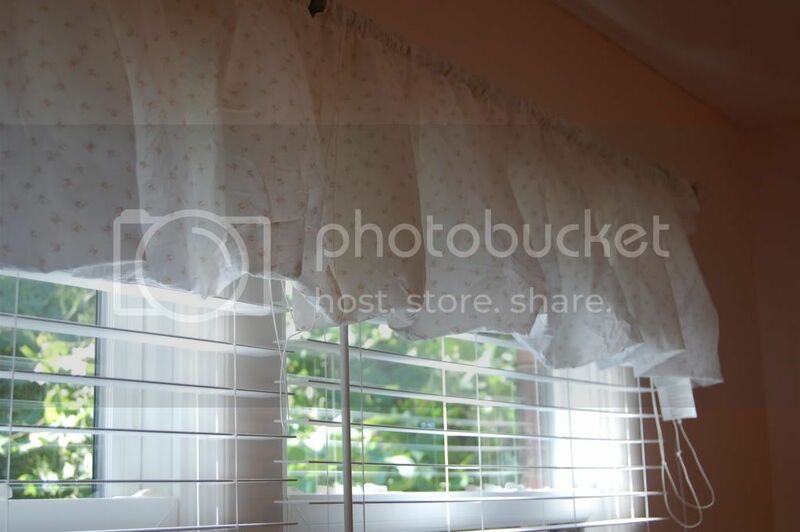 For the valance I simple bought an extra sheet set and made kind of a balloon style valance with the crinkly ruffles along the sides and hung on a long curtain rod with pink glass finales. Found the mirror at Hobby Lobby clearance rack. And don't you love this little tea set? It is lent to us by my sister/niece who had it over 10 years ago. The girls love their room! Now Z wants me to redo his room. My work is never done! As of now I'm redoing the dining room finally! Very cute! 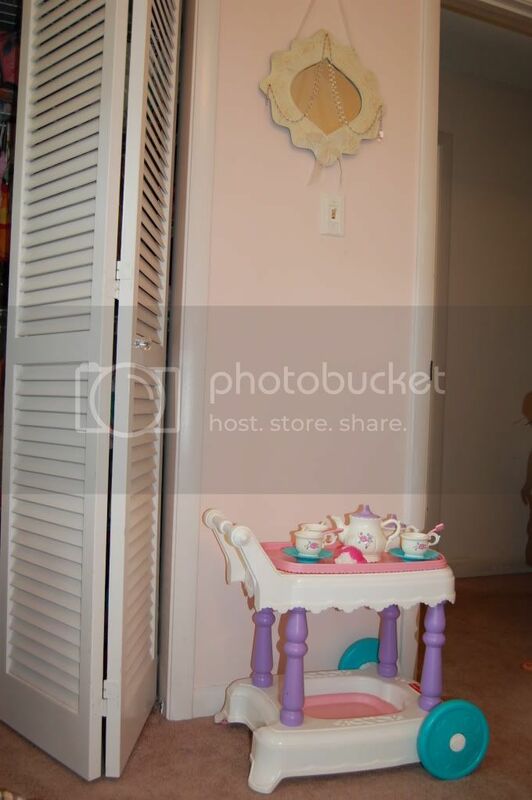 I see a lot of familiar items from my daughter's room which is also done in Targets Shabby Chic Fairytale stuff...I'm still working on hers though. She will probably outgrow it before I ever finish! Anyway, I really like the mirror idea and the hooks for dress-up. I might have to try that. I also thought your art pocket was a great idea. 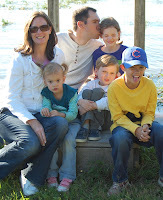 My mom showed me your blog recently and I am really enjoying your craftness and hope to steal some ideas. I'm really hoping your daughter's "Six is Sweet" will come before my daughters 5th so I can copy cat that as well. Thanks for sharing! ooh Deanna that is beautiful. Would you mind if I borrowed your mirror idea? My DD was given some fairy lights as a gift and I haven't known what to do with them until now!! 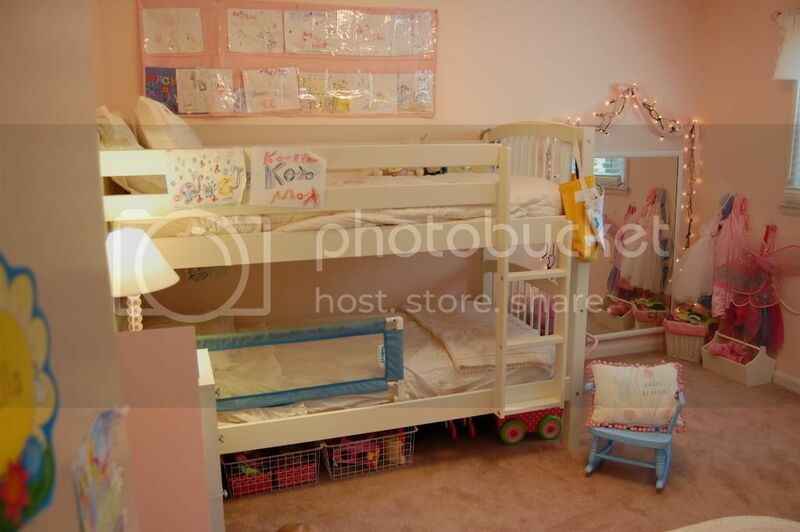 Love the dream room that you created for your daughter. What happy childhood memories she will have. They are such lucky girls. Wow--so many pretty details and fun things for the girlies to enjoy. So cute! You did a great job on the room. 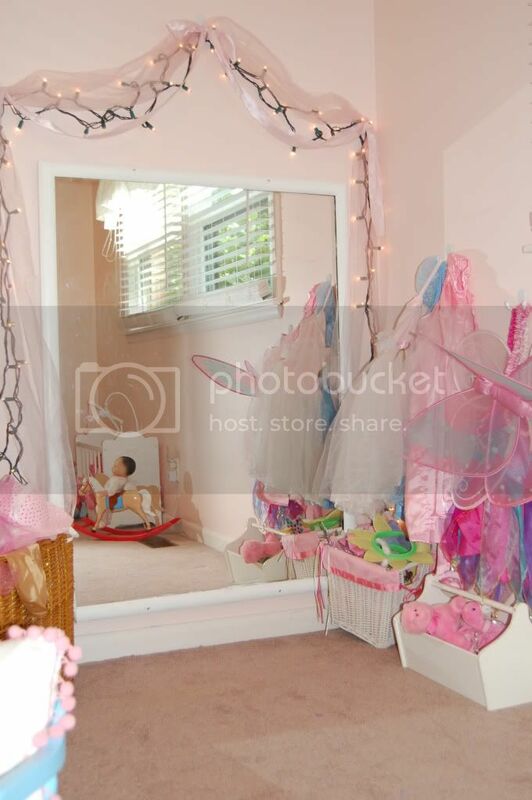 I wish my daughter's room was big enough for a dress up area like you have. She loves to play dress-up! What an adorable room! I love the pink wall!! Would you be able to tell me what color pink you used???? 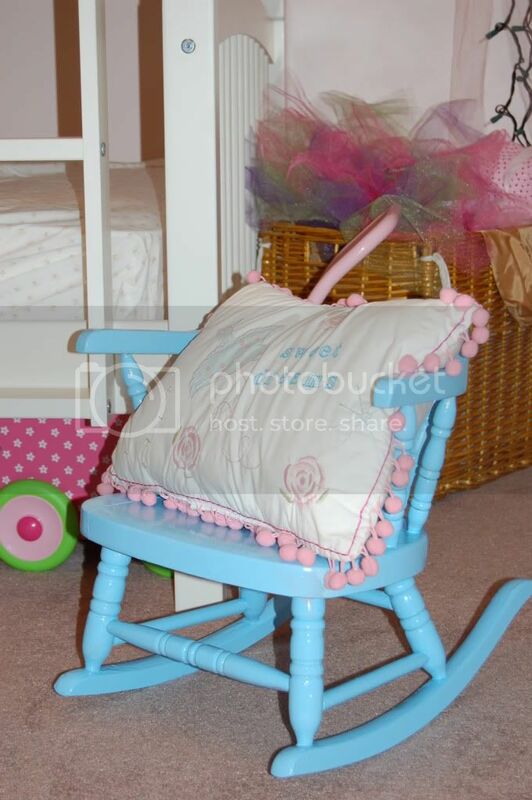 Would love to use the same color for my daughter's room! Thanks! !